tl;dr Infrared Interpretation: a rapid and very effective use of technology to gather data & intelligence for delivery of a quality product to wildfire incident managers. I’ve been on a heck of a run, doing Infrared Interpreter assignments this month - 14 days…well, make that nights. Most days average around 16 hours long..so bear with my wackiness, I’ll try to catch-up on some sleep! IRIN is a position within the Incident Command System (ICS) for wildfire incidents. I was exposed to it as a GIS Specialist for Incident Management (GISS) and attracted to how it combines rapid intelligence and mapping - and all their surrounding associated technologies. At PL 4, a National IR Coordinator takes over the infrared operations from the aviation desk at NICC. This includes receiving the scanner order requests, making sure there are IRINs assigned to each incident, prioritizing the flights according to NMAC, planning the missions with the crews, flight following, trouble-shooting along the flight, remote data uploads, acquiring other resources and reporting accomplishments back to NICC. PL: The five Preparedness Levels range from I to V, with V being the highest level. Orders come in for the various active incidents ongoing - a flight plan is developed for the operational assests available to NIROPS - and IRIN’s are assigned to one or more fires. My workflow as an IRIN: download support data from the incident including most recent fire perimeter, fire line types, organizational work assignment locations (Divisions, Branches, etc. ), review the weather. Following the airplanes with AFF and the pilots via Twitter - I know when my fire has been flown and the data is complete for download & interpretation. Based upon the data, I interpret and adjust the previously know heat perimeter and categorize various types of heat. I generate a few .PDF map products, 4 shapefiles: isolated heat points & scattered/intense and heat perimeter polygons, a .KMZ and a mission log - and return the goods to the incident. 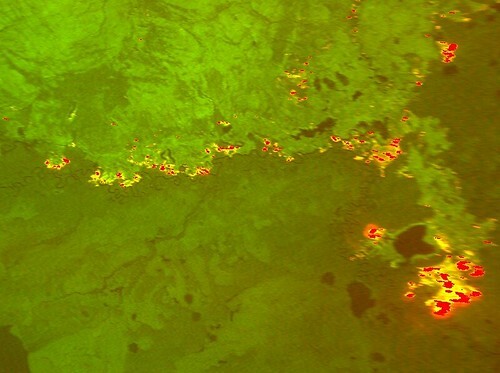 Infrared Interpretation: a rapid and very effective use of technology to gather data & intelligence for delivery of a quality product for wildfire incident managers.